Gateway Chevrolet‘s GM Certified Service Center has the factory-trained service and parts technicians to perform fast, accurate wheel alignments. If your vehicle is due for a wheel alignment, book an appointment today! Why Do I Need to Align My Tires? Your vehicle moves most efficiently when all four wheels are aligned straight up and down. Over time, suspensions will warp and tires will become slightly misaligned. Collisions can also throw wheels out of alignment. Misalignment happens naturally with all vehicles, which is why periodic wheel alignments are a necessary part of any car maintenance schedule. Regular wheel alignments help reduce uneven wear and extends the life of your tires. Tires that are worn unevenly have reduced traction and are at higher risk of blowing out. By keeping your wheels aligned, you are avoiding these unnecessary risks. If a vehicle goes too long without an alignment, the wheel misalignment can actually add stress to other parts of the vehicle and cause permanent damage to the suspension system. Wheel alignments also improve fuel efficiency, meaning this service saves you money on fuel as well as parts and repairs. The most obvious reason to keep your wheels aligned is to ensure that your vehicle is navigating ‘true’. Drivers have many more distractions than in the past, and vehicles that ‘pull’ increase the risk of accidentally going off the road. You should get a wheel alignment whenever you get a new vehicle, when you have new tires installed, or once a year regardless of tire or vehicle age—whichever happens most frequently. If you drive much more than the average person, you may need wheel alignments more frequently. Common signs that your vehicle is due for an alignment are steering problems like ‘pulling’, difficulty handling, and uneven tire wear. A wheel alignment should also be performed if you have had recent service or parts replacement involving your suspension system (tie rods, control arm bushings, etc.) or if your vehicle has experienced a significant impact that may have caused physical damage to the car’s frame. If you are due for an alignment, do not put it off. If you wait until damage to the tires is significant you could be endangering yourself and others as well as costing yourself hundreds of extra dollars in repairs. When you come in for an alignment, our GM technicians will be making adjustments to your wheels’ camber, caster, and toe. These are primary angles indicating the alignment of the wheels relative to one another and to the vehicle body. Camber indicates whether wheels are vertically aligned. If the top of the wheel is tilted away from the vehicle, then there is negative camber. 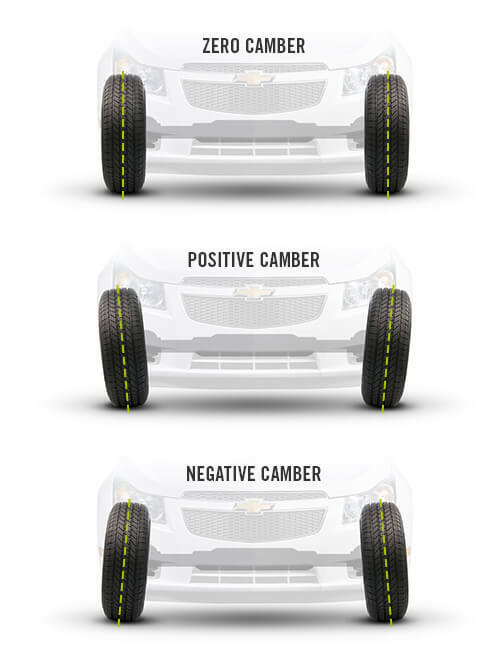 Camber affects tire grip when making sharp turns and general ease of handling. Caster is the forward or rearward tilt of the steering knuckle from a perfectly verticle line. Proper caster optimizes the vehicle’s straight-line stability. Toe is used only in front-end alignments and describes the angle inward or outward of the front wheels. Gateway Chevrolet’s state-of-the-art equipment and years of experience means that we can perform alignments quickly and effectively, which saves time and money. We pass these savings on to our service center customers, so you know you are getting the best maintenance for your GM vehicle at the lowest price possible. At Gateway, we also run seasonal service specials which can be seen here. If there is no advertised alignment discount during the time that you need this service, ask a tech for more information on available discounts. If you’d like to have your wheels aligned at Brampton’s premier GM Certified Service Center, book an appointment now!